Gaiman's works of nonfiction prove just as powerful as his fiction in exploring the lasting place of fiction and imagination in the real world. Neil Gaiman is most recognized for the power of his imagination, with novels like Coraline, comics like Sandman and television credits like Doctor Who underscoring his ability to dream up impossible worlds and turn them into a reality. His nonfiction is just as compelling (and, perhaps not surprisingly, just as imaginative), as collected in The View from the Cheap Seats: Selected Nonfictions. The pieces here don't always qualify as essays in the truest sense of the word. Book introductions lead to speeches, which mingle with essays, which sit beside articles--and this "motley bunch," as Gaiman dubs them, combines to provide readers with a glimpse into his creative genius. The subjects, too, vary as much as the delivery formats. The View from the Cheap Seats explores the writing of American Gods; the immigrant experience; what it is to be a child--and what it is to raise them; the powerful, almost inexplicable draw of science fiction and fantasy works across the years; the role of truth in fiction; and freedom of speech. "Some of them are serious and some of them are frivolous and some of them are earnest and some of them I wrote to try and make people listen," Gaiman explains. Whether it was his intent or not, every piece in The View from the Cheap Seats will make people listen--and pay attention, and think, and ponder over the role of stories, both real and imagined, in shaping our lives. I read (and reviewed) a print galley of this title (thanks, publisher! 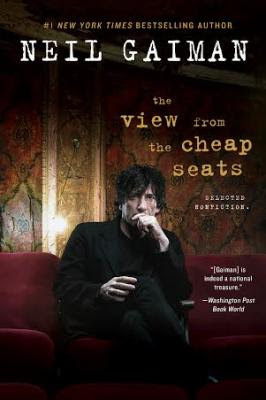 ), but worth noting that the audiobook of The View from the Cheap Seats is narrated by Neil Gaiman himself, who is one hell of a narrator.